Walking into one of the many instructional sessions held last year in GW Libraries’ Special Collections Research Center (SCRC), you would have seen blindfolded students holding books and attempting to determine the genre of each based on smell, size, binding materials, and other factors. This exercise, a part of Professor Holly Dugan’s course, Radical Books in the English Renaissance, is designed to help students realize their already deep understanding of the varied materiality of books. “It is amazing how much you already know about books and printing once sight is no longer a factor,” she explained. Dugan was initially referred to the SCRC by a colleague, and when she began developing a course based on the history and culture of print, she knew that SCRC would be able to provide a wealth of great resources her students would love. She connected with Leah Richardson, research and instruction librarian for Special Collections, and together, they began developing plans for incorporating rare books into the course. “The librarians in Special Collections have been absolutely wonderful,” Dugan said. 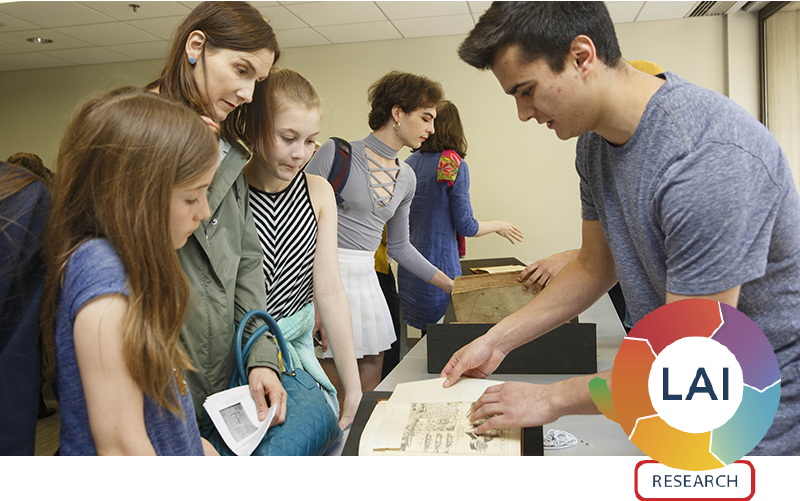 “Their knowledge and care regarding the collections have been astounding, and I think the students gravitated to their materials very well.” The class worked with many of the early modern books from the SCRC, including Roger Marbecke’s Defense of Tobacco (1602), Isaac Newton’s Method of Fluxions (1737), and a 1634 bible printed by Robert Barker, a well-known English printer. Not only were students able to learn about the general history of the books, but they also delved into the details of specific copies of these books, looking at them as pieces of material culture with stories to tell about cultural norms and technological innovations. Who owned it, who read it, how much it cost, and who ultimately donated it to the SCRC were all questions that were a part of their book biography research.